The city of Aurora is the second largest city in Illinois, and because Carmody Construction is located in neighboring Oswego, we have completed many residential and commercial construction projects throughout the city of Aurora. With years of experience as one of Aurora’s leading contractors, Carmody Construction is the go-to Aurora Illinois construction contractor. Aurora has continued to grow since the 1960s when it was simply a mid-sized manufacturing city. Divided by the beautiful Fox River, downtown Aurora is home to some impressive architecture from the manufacturing boom. The current hub of Aurora is the downtown Burlington Northern Santa Fe railroad station, which sits adjacent to the ever popular Two Brothers Roundhouse micro-brewery and cafe. More recently, downtown revitalization projects have helped the city maintain some of its historical roots. Entertainment has always been central to Aurora with the RiversEdge Park and Paramount Theatre on the National Register of Historic Places and the Hollywood Casino Aurora right on the Fox Valley River. Large employers like Caterpillar, Inc. and other manufacturing companies have kept the city strong economically and helped with growth. 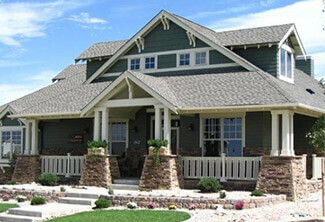 Carmody Construction has completed siding, roofing, windows and renovation projects all across Aurora. We are a locally owned family operation that’s been in business since 1948. It’s that local hometown feel that makes Carmody the Aurora contractor many homeowners and businesses have come to trust and rely upon. Whether you’re looking to remodel a kitchen, bathroom or to finish your basement, Carmody Construction is the Aurora construction company to call. We offer easy 0 percent financing for up to 21 months, and we work with many of the top brands in the business, including Andersen Windows & Doors, CertainTeed and Millgard. Carmody also offers free, no obligation consultations. Contact us or call (630) 355-0002 to talk to a company representative today! Live in Aurora? Need Windows, Siding, or Roofing Services? Schedule an appointment today! Carmody Construction was great for me! I had two large picture windows framed with a window on each side. The sales guy came out, completed a quote, educated me on the different types of windows, and helped me acquire a “no interest for 6 months” credit card to pay for the work. I was to have a huge pig roast 3 months from the estimate date, and told him I would need to know that these windows would be installed by the date of the party. Carmody Construction stayed true to their word. The installation was done well and on time. I am saving a lot of money with my gas and electric bill that they will have paid for themselves by this time next year. I plan on using them again when I get a few more windows replaced. I have recommended them to others and will again!